GDC Technology Limited, a leading global provider of digital cinema solutions, today announced that its next-generation integrated media block (IMB) and new 16-channel cinema sound processor will be installed at the new Schulman Film Alley in Weatherford, Texas. 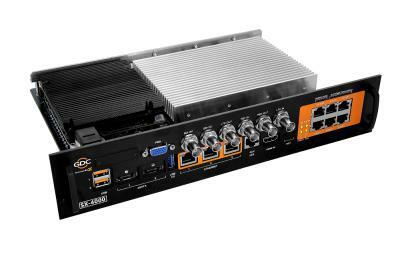 Based on proven GDC technology, a cinema owner’s reliable choice since 2000, the fully DCI complaint GDC SX-4000 Standalone IMB® and XSP-1000 Cinema Processor (GDC Immersive Sound Solution) comprises of a future-proof IMB with real-time DTS:X™ decoding and an advanced cinema processor. This latest GDC Technology bundled solution* enables the new Schulman complex to affordably install immersive sound in all eight dine-in auditoriums in the future. At the same time, the GDC SX-4000 IMB is designed to keep up with upcoming technologies and standards. The new Schulman Film Alley is scheduled to open to the public on October 28, 2016. Schulman Theatres partnered with Sonic Equipment Company for the system integration. Faster processing: Next-generation hardware with faster input and output capabilities. Higher bitrate: Decoding higher bitrate images and audio files; live or store-and-forward. 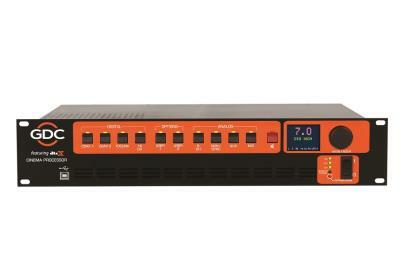 18-Channels: Full 16-channel immersive sound capability with two aux channels for other devices. Transcends 5.1 audio: Unbinds the sound from traditional 5.1 with upmix capability to increase the number of channels for pre-show entertainment programs and alternative content. High reliability: delivers a significant improvement in overall system stability by being integrated with bypass audio circuitry, which allows it to remain operational in the unlikely event of a system failure. Low noise digital processing: features low noise digital processing, with up to 96kHz sample rate, which ensures superb audio fidelity and presentation. User-friendly GUI control: runs on Windows operating systems, which allows for complete system configuration, monitoring and firmware upgrades over USB and Ethernet. Automatic equalization: uses user-defined microphone calibration files and standard or user-defined equalization curves to automatically adjust the graphic equalizer on each channel. Supports multiple immersive object-based sound formats: includes the latest DTS:X format, and is also compatible with traditional 5.1/7.1 surround sound formats. Multifunctional control buttons: shows the current fader level, the format name (which is user configurable), and the measured audio level on each channel of the main audio output on the front panel display. "Being a modern pioneer means to be able to adapt and change. In fact, pioneering is essential to have a future," said Tony Adamson, senior vice president, strategic planning of GDC Technology. "By choosing this new solution from GDC, Schulman Theatres has ensured as technology changes, its new Film Alley will be ready." GDC will be at ShowEast 2016 from October 18 to 20. To schedule a meeting to learn more about the features and benefits of the GDC Immersive Sound Solution and other improved GDC digital cinema products, such as the TMS-2000 and Library Management solution built with GDC CLA-2000 and Enterprise Storage Plus, contact Paul Marcot at paul.marcot@gdctech.com. *GDC Immersive Sound Solution is also sold separately.